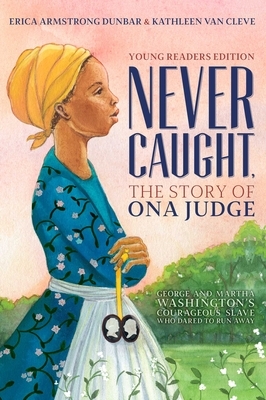 A National Book Award Finalist for Nonfiction, Never Caught is the eye-opening narrative of Ona Judge, George and Martha Washington’s runaway slave, who risked everything for a better life—now available as a young reader’s edition! In this incredible narrative, Erica Armstrong Dunbar reveals a fascinating and heartbreaking behind-the-scenes look at the Washingtons’ when they were the First Family—and an in-depth look at their slave, Ona Judge, who dared to escape from one of the nation’s Founding Fathers. Born into a life of slavery, Ona Judge eventually grew up to be George and Martha Washington’s “favored” dower slave. When she was told that she was going to be given as a wedding gift to Martha Washington’s granddaughter, Ona made the bold and brave decision to flee to the north, where she would be a fugitive. From her childhood, to her time with the Washingtons and living in the slave quarters, to her escape to New Hampshire, Erica Armstrong Dunbar (along with Kathleen Van Cleve), shares an intimate glimpse into the life of a little-known, but powerful figure in history, and her brave journey as she fled the most powerful couple in the country. Kathleen Van Cleve teaches creative writing and film at the University of Pennsylvania. She has written three books, including the award-winning middle grade novel Drizzle and lives in Philadelphia with her husband and sons.